Mimic is likely more well known in the film community for Guillermo Del Toro’s public disowning of the piece after Weinstein interference. That’s a shame, because despite insistence that the idea was trashed to a B-movie concept, the public had enough affinity for it to spawn dual sequels. Maybe the theatrical end product was trashed. 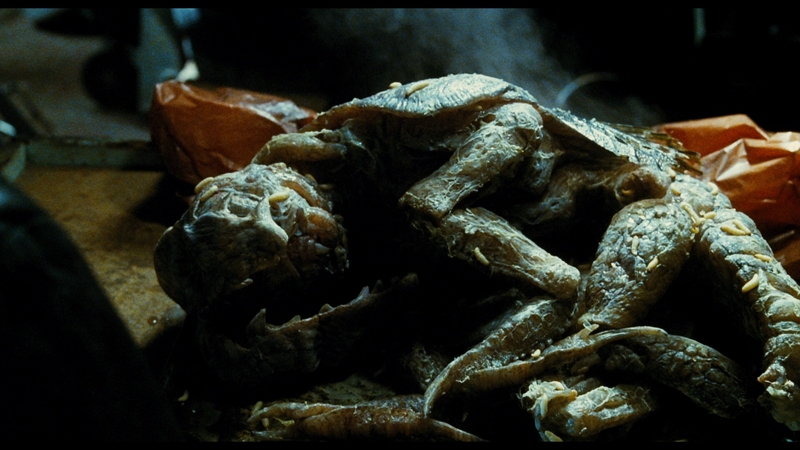 Del Toro’s idea, that of the human-spawned bugs taking over for humanity on the evolutionary scale, sounds fantastic. What’s here though is more than serviceable, a dingy, dirty ’90s creature fare with a menagerie of imaginative physical designs and hardly forever CG spots. New York’s underbelly becomes a catalyst, using the sounds and the flavor of city going personalities to best a majority of mutant bug flicks. Looking at it now, Del Toro shoves scenes back in intended originally, fragmenting the ideas of human exploitation and evolution. Full bodied, the concepts could have found their look. Treated as discarded leftovers, Mimic begins to break apart. What is gained by becoming a more brooding, densely paced film it loses in its initial appeal. There are other ideas that feel like scraps, Mia Sorvino’s mental toll as she realizes what she is responsible for. The Judas breed of conjoined insects were genetically designed to protect children from a carrier of disease: cockroaches. Her fail safe wasn’t so safe. That’s led to the further break down of DNA, turning the bugs into increasingly human-like specimens. That gives them an immediate visual fear, their rotting skin and exoskeleton faces unnerving. They work better as creatures of the dark, stalking, viewed as shadows. Mimic insists on only sparse breaks of physical panic. The rest is insinuated by the camera. Undoubtedly, that’s part of why Mimic works without Del Toro’s ideals. As a general B flick, it’s higher concept than most, more concerned with fright and growing fear than munched on civilians. It’s unafraid to go against conventions, the Judas designed to save kids, now killing them as a food source. The back half, more contained to a subway set that is rife with dusty, picturesque rust, sells the heaviest combat. Survivors become centrally located, unable to escape a lair that serves as a breeding ground. A screechy score by Marco Beltrami accentuates the insect-ish clicking, frenzied during those close encounters, droll during searches, but also a presence. Regardless of its form or broken Hollywood relationships, Mimic’s elements exude vision and imagination, which is miles ahead of where the genre tends to be now. Included in the Mimic three film set is the same disc that was released on its own accord last year. The encode is identical, as if such a short time span would warrant a do over. Problems are apparent where the compression falters, this despite a steadfast bitrate, which as usual proves that numbers mean little. Mimic was captured with what was clearly a heavy grained film stock, leading to outbursts of screen swarming grain. There’s nothing wrong with that, so much as there is the codec’s inability to resolve what’s put in front it. While black levels are fitted with enough intentional crush to subdue a wide portion of the screen, walls, ceilings, or other portions can swarm more than the Judas bugs. Couple that with what are now vintage CG effects, and the bulk of the problem can be exasperated. There’s still a lot to salvage from Mimic, not the least of which is the facial detail pulled from consistently tight close-ups. Not a character goes by without at least one firmly defined moment of facial detail, texturing a film that can hardly be considered lit. Disgusting bug props, loaded with maggots and fleshy skin, are more vivid than ever in their inhumanity. More apparent on Blu-ray is the color space too, bringing out the sense of warmth topside, and that eerie chill below. The conflicting lighting schemes include blown out flesh tones and flattened hues, changes becoming scene dependent. Oranges feel heavier, almost giving the actors a neon glow, so it’s debatable as to whether or not the disc pushes too far. The effect is certainly unmistakable now. Remixed into a blistering 7.1, Mimic erects a wall of sound that doesn’t give out. It’s memorable aural moments are impossible to number, because it’s the entire movie showing off from the swirl of the opening credits. The additional speakers are sandwiched in without any loss or artificiality to the original audio. It’s simply more open and spacious. Mimic does everything, from capturing the grimy, dripping water of the sewer system to the vibrancy of New York life street side. Echoes in abandoned subways are phenomenal, spacing what was surely a locked, limiting set. Storms load the available channels with ambiance, although not to the level of the creature movement. Clicking becomes a locator beacon, the precision of mix instantly placing bugs within the mix. When they’re aggressive, they slam against doors generating a hearty, bulky LFE. When they’re sedate or searching for food, they’re sneaky, just loud enough to make the reaction palpable. Placement is precise enough to create fear even without the visuals. The finale, a series of explosions that rock the city topside and its subway, generate sufficient oomph, certainly enough to sell the idea. A video prologue from Del Toro himself is wonderful. He states his thoughts, how he’s glad to be involved, and he’ll say whatever he can within “legal means.” One wonders how far he would go in this solo commentary were it not for the restraints. Reclaiming Mimic lets Del Toro lay out his vision for the film candidly, with expletives and annunciations that express his displeasure. A Leap in Evolution and Back in the Tunnels have been around since the original DVD release, the former focused on the bugs (and their design), the latter a generic making of. Deleted scenes include an alternate ending, although not the one spoke of elsewhere on the disc. Animatics deliver the process of making the film via a different method, while a gag reel has a number of laughs worth checking out. The disc is stuffed with trailers too, enough that there are eight chapter skips just to reach the main menu.